You can play Spades online just by registering an account with your email or Facebook. But if you don’t know what are you doing and lose too many games, you risk running out of playing chips and having to wait for some more. That’s why before starting it’s helpful to know the different variations of Spades, which one is best suited to your gameplay, and a bit of basic strategy to put that knowledge to use. Before going into the game, whether you’re playing spades online free or wagering some real money, it’s important to make clear what game you’re actually playing—some players are particularly talented card sharps in one form of the game but utterly ineffective in another. Some players love going blind nil and making it happen—other players prefer game types where this isn’t even allowed! After all, one of the most fun parts about playing Spades online is how easily it is to still play with real people. Know what you’re doing and what you’re playing first! Before concerning yourself with which type of game to play, it helps to know how to play Spades in general. The rules are fairly simple despite allowing for some very complex gameplay. The entire deck is dealt to four people whether in pairs or playing solo. The goal of the game is the opposite of hearts with Spades as a trump card—you want as many tricks as possible. And you bid on how many tricks you will take before you look at your hand. Some of us like playing cards with other people, but we don’t want to rely on their skills for maximizing our coin. Solo is still a four-person game, but rather than gifting tricks to your partner across from you, you’re hoping to tank individual players with scores higher than yours. Having a horrible hand isn’t always so terrible when you’re playing pairs. You can do your best to try and give your high-bidding partner all the tricks they need, and you have someone else to help you get your measly trick or two needed to avoid going in the negative! When playing a trick-taking card game online free, you might not know your partner, but it’s still always fun to be in cahoots with another when duking it out against other real life card players. This team version of Spades rules is only for those who consider themselves Spades whizzes themselves, or it’s going to be very frustrating! In the Whiz game type, you must bid the exact number of trumps you have or bid nil. You are not allowed to bid a Blind Nil either! 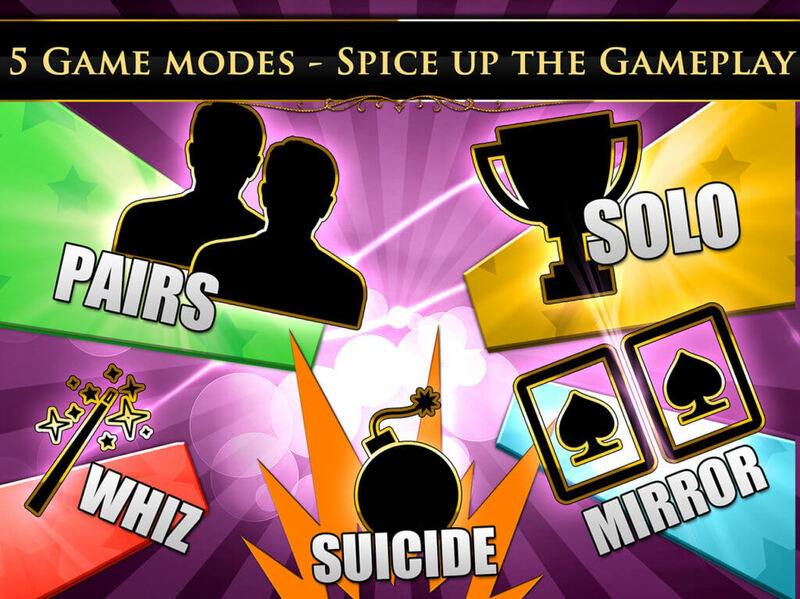 In Suicides, it’s Pairs Spades plus one of the members of the team must bid Nil and the other must bid at least four. Really puts pressure on the teams to work in tandem—no lucking out by getting carried by your partner! No Blind Nils in Suicide either. If the first bidder bids 4+, and his partner decides to bid a non-nil too, he gets the bid and the first bidder gets the 0 bid. You don’t get to know which spades a player has, but in Mirror each player has to announce the number of spades they have at the start of a game. There are no Blind Nil bids, and if you get none, you must bid Nil! If you’re a beginning, I recommend playing pairs. Many want to start off with solo gameplay because they worry about letting down another person. Admirable, however by playing with a partner where you aren’t trying to steal their tricks and are alternatively helped to get extra tricks, you get a feel for the strategy of the gameplay that is still required in solo. Whereas in pairs you’re playing against a team, in solo gameplay you are trying to play against three different players with different scores and different goals. Before you navigate that game type or the even more intense scoring pairs styles, you should just play pairs first. Then work your way to Spades plus other variations. Some enjoy the novelty of Suicide and Whiz every once in awhile, but Spades solo and plain Spades pairs are by far the most popular gametypes. But make sure you understand the rules if you choose to play different variations of Spades!